Ultrabooks are extremely thin and light laptop computers. In fact, according to the specifications they are supposed to be less than 0.71 inches thick if their displays measure less than 14 inches. They are also supposed to be able to handle almost all of the same tasks as a standard notebook. Being this thin and light makes them extremely portable but also comes with the minor limitation of not having an onboard optical drive; fortunately, those are not absolutely necessary these days. The concept of the Ultrabook is less of a technical specification than it is a marketing term coined by Intel to categorize certain computers featuring its technology. This Intel Technology includes the Core i3, i5 and i7 processors. These ultra-thin ultrabooks are primarily Windows computers the dimensions of which could be compared to Apple’s MacBook Air. These days much of the work done in high schools and universities requires the student to have a fast computer, preferably one that they can carry around with them easily. Computers are essential for note-taking and research purposes and depending on the course the student is taking, it may be needed for the work itself. They help students to do all their tasks more efficiently. There are many important factors that go into the consideration for a student notebook. The computer will need to be able to run the software needed for the course, it will also need to be easily portable without presenting a burden to the student. As they are built with portability in mind but are still powerful devices, Ultrabooks are better for the average student than any other style of notebook. • They can easily fit within a backpack or purse along with other study-related items, with little additional weight. As students walk from class to class, the weight they have to carry in backpacks can become a problem. Ultrabooks provide ample computing power but in a lighter package. Often weighing under three pounds. • They offer long battery life for those who often find themselves away from electrical outlets. Students can work on the go for longer stretches as Ultrabooks tend to have decent-to-excellent battery duration. Most Ultrabooks can last between five and eight hours on battery power alone. • Touchscreens are available on many models, particularly those powered by Windows 8, so that the student can have all the convenience of a tablet without losing the keyboard. 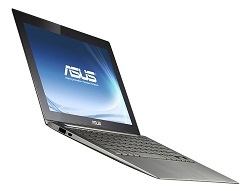 • To qualify for Ultrabook status, a notebook will need a blazing fast wake up time. These computers must be able to wake up in seven seconds or less. To accomplish this, many of the more expensive models operate on solid state memory alone rather than be hindered by a traditional hard drive, just like Apple computers. • There are security features built into the Intel processors that power these machines. Each processor has identification technology allowing it to be remotely shut down, preventing the theft of any confidential information stored on it if the computer is stolen. Students considering a notebook purchase that will take them through most (if not all) of their school career should be able to accomplish all they need to accomplish with the use of an Ultrabook. These computers should remove a lot of the technology-related stress factors that come with standard notebooks. Today’s guest post is by Courtney Lee, a blogger from California who enjoys spending her free time writing helpful articles on her ultra-thin ultrabook for her fellow tech enthusiasts.